Death was a more accepted part of the human existence in the 1800s and early 1900s. People died more often at younger ages and it was common to have to deal with death earlier in life. Perhaps then it's not surprising that there are a strikingly large number of photographs from this time that depict death. We've probably all seen photos of outlaws, sometimes plugged with multiple bullet holes surrounded by curious or happy town folk. One aspect of photography from this era that is very prominent, but not as well known is "post-mortem photography," or staged photos of deceased persons often arranged into family pictures or in posed settings to make them seem more alive. Today these photos seem very strange to us. We take so many photos of people when they're living, it would seem odd to remember someone in such an unnatural state, but back in this era, people did not take as many photos. Sometimes these would be the only photos of the whole family or all the kids. I saved this photo because for the last several years the students in my history classes have been conducting cemetery surveys in local graveyards for the local historical society. I haven't quite figured out what to make of this photo. What are your thoughts? You can of course do an internet image search for "post-mortem photos" and come across plenty of examples online. I saved this one because it was local, but I still haven't decided if I will share it with my students. of shoes, I think "Maybe there was something good in this we are missing in modern times. that early death among our relatives and friends is so much rarer today. These people didn't have film; they had still photos. I assume they would have preferred a picture of their loved one as a living person, but this was the next best thing. 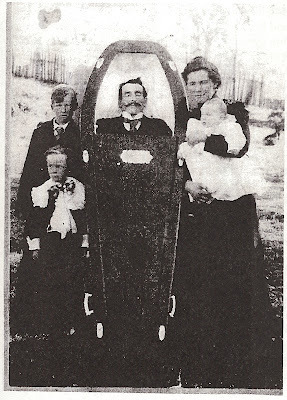 Those children may have never had a visual memory of their father if they hadn't taken this post-mortem photo. Everything is relative when it comes to understanding the past IMHO. Death comes to all in the end - or, at least, that is what they say. This photo looks strange to me. The children on the left looked a little shell shocked, and the mama looks almost like she has a "Mona Lisa" smile. Probably just the wear and tear on the photo, but it looks odd to me. My first thought was she is smiling - maybe this photo is her saying, "I am finally rid of the SOB, he was so mean to me!" Post-mortems were somwhat common in the early days of photography - in this country at least. I have seen photos of families dressed up in the studio with someone propped up in the group. You have to look hard to see that someone in the group is actually dead. It seems odd to me. I can understand wanting the memory of your loved one though, and a photograph is better than preserving the body ( a la Lenin in Russia). Nate, since this is local history, have you any information on how this family survived? It is sad to see the mother with three children and no father. It must have been quite rough for them. I've seen some interesting post mortems over the years. Things were definitely different then. The saddest ones are the ones you will see of children. I am under the impression that in most cases, those are the only pictures the families at the time ever took as photography was expensive back in the day. Virgil, not that I would wish to live in different times, but the certainty of death as an ever present reality allows people to make better choices in the present. Perspective I wish more of my students would have. Then again, maybe they'd make many of the same choices with full knowledge or perhaps not. Chuck, I'll have to look for "The Decalogue," sounds interesting. When my uncle died recently I remember my mother asking people down there to take a photo of him - I think to provide some mental closure. Michael, I think it may be the wear of the photo and the poor quality of the reproduction that makes the mother's facial expression seem out of place. Her eyes certainly don't match her smile. Mary, the article was sent in by Ken Fitzgibbons, the son of the younger boy (Otis Fitzgibbons) on the left. The article is a larger account of Ken's memories about growing up in this area. There is little else mentioned about the father and mother in the photo. It says that the deceased is Michael Fitzgibbons of Ireland. The mother was Maggie Waiters of Elliejay, Georgia. Most of the article is about growing up in the country here locally. It's an interesting article. Beki, I agree, the saddest photos are of the children. Thanks for commenting. In my view, a good portion of the so-called memento mori photos of the latter half of the 19th Century aren't really of dead people, although it makes a good tag when one is trying to sell it on eBay. Perhaps it has something to do with the often vacant look in the eyes that gets people thinking, but that effect is usually due to the differing responses of early photographic emulsions to certain wavelengths of light, e.g. blue eyes. There is no doubt about your photograph, of course. As in my recent posting of a late Victorian funeral (A Black Horse, a Black Hearse ...) the deceased's body is prominently displayed in the coffin, indeed the focus of the portrait. It's seems a macabre practice to me, particularly with the coffin at such an alarming pitch, but I can imagine the horror with which they would view many things of our time. In the 19th and early 20th centuries, the Mexican people had a tradition of photographing their dead children. (Or, failing a camera, creating a picture of them). Looking at the pictures, these children are obviously dead, not sleeping. In fact, some of them look as if they've been dead a few days. The set-ups are usually quite elaborate. The publication "Artes de Mexico" devoted an entire issues to "El Arte Ritual de la muerte nina" (The ritual art of the dead child). Ken Fitzgibbons appreciates your publishing this photo of his father, Otis (the younger boy) and deceased grandfather Michael Fitzgibbons. The mother Margaret nee Waiters is not smiling in the original photo. Her expression is more like a grimace, almost a ris sardonicus. The family fell on hard times for a time after the death of Michael-who had managed in his short life to acquire two properties. From the taut facial features death appears to have come through dehydration. He was said to have to died of dysentery in his 39th year. The baby Ramona ultimately was 'au paired' with a Jewish family. She married John Jenkins and lived in Shell Beach until her death at about age 95. Otis died of tuberculosis in 1933 at the VA hospital Wadsworth-his son Kenneth was orphaned and raised in the Pleyto country by W. Dewey Moore and Rose nee Kavanagh. The older boy, Bob Scott, a child of Margaret Waiters by a prior liaison, lived his life in Paso Robles: occupation-card player and gambler at Duke's Smoke Shop. Dr Fitzgibbons, thanks for writing and thanks for the additional information. Interesting to hear you describe things from a medical perspective too. I teach high school history in Paso Robles, but my classes have done a bit of work in the local cemeteries. Thanks for providing all the great family information! It is a great photo. Please thank Ken for sharing it with me. If you want your picture to be perfect, and you need a giant eraser to do it. hdreditingsoftware.com erases those unwanted memories.